Immigration is bringing a taste of Africa to Winnipeg. "We miss home ... in Nigeria, so a taste of home every morning won't be bad," said a customer at Arabelle's Bakery on Archibald Street as she shopped for traditional Nigerian bread. In a small corner of St. Vital, the growing African population is starting to impact the retail landscape in one way: Food. For many newcomers to Canada, being able to buy their traditional food is a way to keep connected to their home country. Temi Akindipe, who is originally from Nigeria, and her husband, Bryan, own Arabelle's. When they came to Canada, they craved Nigerian bread but could only find frozen bread shipped in from Toronto. They decided to make their own so customers could buy it fresh. "When you go to Africa, this is the bread you eat. This is what most of us grew up with. It resonated with a lot of Africans. It's like the bread your mother or grandmother made." And that bread has gone mainstream. Arabelle's famous Lagos Loaf can now be found in 13 stores across Winnipeg, including Red River Co-op food stores and the newly arrived Save-On-Foods grocery stores. "We're not just serving Africans. We're serving the city." Just around the corner on Fermor Avenue, another African food store has opened up in the past year. 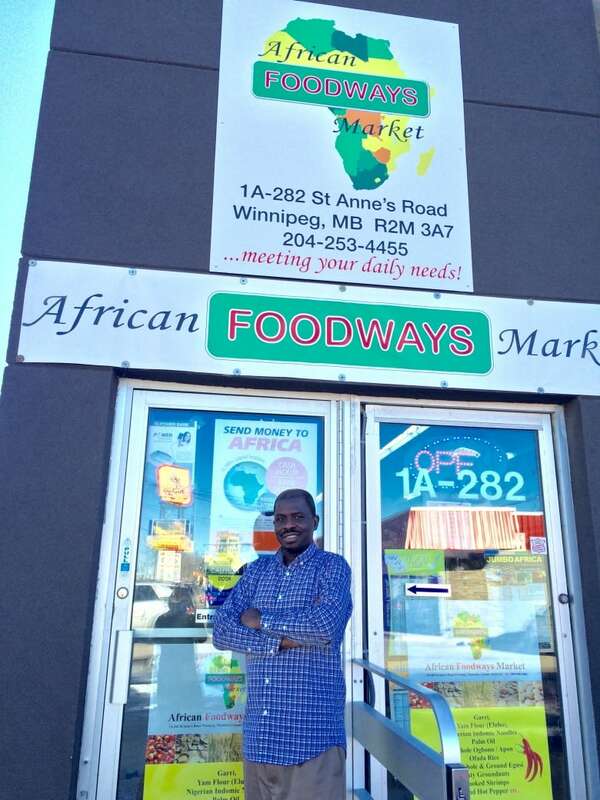 African Foodways Market is owned by Sunday Fasina, who arrived from Nigeria with his family in 2013 and opened the African grocery store in May. "Back home, you could go behind your house and harvest vegetables. You can't do that here, so you really miss that," Fasina said. "We try to create something very similar to that by bringing in food items from Africa so that our African brothers and sisters can have a feel of home and they won't look back too much." Fasina wants his grocery store to be a one-stop shop for everything Africa. Customers can find traditional African music, clothing and beauty products on its shelves, including rows and rows of hair weaves in every colour, length and style. Of course, there are aisles and aisles of traditional food and ingredients. The shops are opening in that pocket of St. Vital for a simple reason: The customers are there. "This area is home to Africa," Fasina said. "You have Jamaicans, Tunisians, Ethiopians, Somalians, Sudanese, Nigerian Francophone West Africans. Everybody's here." Iftu Ibrahim, a newcomer immigrant settlement worker in St. Vital, said since 2015, almost 60 families from across Africa have moved into the area. Akindipe never realised how something as simple as food could impact this growing community. "When you think of the happiness that you're bringing into people's homes when you have products like this, when you think that just me baking bread in the kitchen is making a difference to someone else, that is profound. When you come into the store and you haven't opened the store and there's a line out there waiting to buy the bread … that is satisfying."